Plantar fasciitis got you down when you ought to be standing up? You cannot afford to suffer from foot pain during your long and hard work day. As a hard working man or woman, you’ll need to be standing safely, comfortably and well supported. If you want to wear boots that will either prevent or cure your foot affliction, then you will have to look for boots that give you really good heel support. Usually, these types of boots will have deep molded heel cups, which are going to give you a very cushioned support. When you’ve got deep heel cups, you ensure that your heels are very well encased in the boot. This will protect you from excessive amounts of pressure and abrasion, whether you are walking on sand, stones or gravel. Next to that, your boots should also be relatively flexible. It will not help you when you have a very stiff boot. Your foot makes a rolling motion with every step you take. So the boot needs to simply bend along with the foot. If it remains stiff, it exerts detrimental pressure onto the sole of your foot, directly irritating your poor plantar fascia. There are a few boot makers out there who are well known for building boots that are very well suited for this affliction. Among these are big brands that you’ve probably already heard of, such as Ariat, Chippewa, Thorogood, Danner, Caterpillar, Wolverine, Timberland and others. The right pair of work boots is very essential for both men and women who move around a lot, during the course of their work. Men work boots are specifically designed to provide comfort while being waterproof. To ensure that you have a pain-free day during your work, it is essential to select the right work boot for your work. For your convenience, I have created the top 20 top rated boots from 20 different brands for men and women! Caterpillar is a boot designed for the hardworking man. These boots feature waterproof, genuine leather as well as a lace-up leather shaft. Lots of internal warmth is offered by no less than 200g of insulation. It also comes with padded collars, which add comfort and support. A nylon mesh lining helps to wick the moisture away. This boot can handle all weather conditions in style. These waterproof boots combine style and comfort with durability to produce a workboot for hard working men, who demand the best from themselves. Using the ERGO comfort system from Cat, this boot is specifically crafted to ensure that the natural movement of your foot is adequately supported. On top of that, it is anatomically correct in order to ensure flexibility, comfort and stability. Unlike workboots with a generic, flat shape, this boot comes with specific contours, to support your daily steps. The 6-inch shaft, that is high-cut, is adequately padded to provide long-lasting support throughout your whole day. A steel toe keeps your toes protected from any forefoot impacts. This boot has also been designed with SuperWelt construction to provide forefoot flexibility, as well as reliable performance. 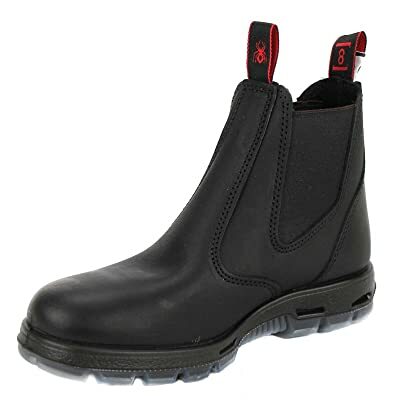 This low-profile and sporty boot will endure wet weather, without sacrificing comfort or style. The torsion has been made to appear like an athletic shoe. But it is tough enough to handle rough environments. These work boots are designed to make your work easier. On top of that, they are stylish and versatile enough. This means that you don’t have to buy different shoes for the occasional stroll downtown and daily work routine. They can serve both purposes. From construction work to hiking, this boot will deliver. The upper is made of suede and waterproof leather. The sole has been crafted using rubber. I’m sure that, by now, it’s becoming clear to you that this work boot was designed for durability. For protection and strength of the toes, the tongue is adequately padded. A cushioned insole provides you with lots of comfort straight out of the box. In a nutshell, both quality and comfort are well combined in this classy men’s work boot. The upper comes with a lace-up front that has metal eyelets. You can use these to adjust your boot to fit to your size. These boots are comfortable to wear straight out of the box and they don’t require much of a break in period. They are very flexible and their durability is one of the best. If you work or live in wet or cold environments, then these Skechers can save your life. It is warm on the inside and fully waterproof. This work boot is one of the most popular in the market today, for several reasons. The boots have been constructed using truly-tough, red russet leather. It has a mock toe, that comes with triple stitching. An extra thick, rubber wedge outsole is crafted with sufficient traction, for providing an aggressive grip on various surfaces. These lace-up boots have metal eyelets and a removable polyurethane footbed, that provides underfoot comfort. In terms of comfort, the break in period required for these work boots is very minimal. They are comfortable straight out of the box. Once you’ve worn them for a single day, the leather will soften nicely and flex a little more. They also come with an EVA midsole and a removable and replaceable footbed providing adequate cushioning, for all day comfort. A padded collar and tongue prevents rubbing, while providing cushioning at the same time. They have been certified as electrical hazard safe work boots, with ample protection to the whole foot. Their versatility is paramount. They can be used on site survey, deliveries, factory environments, and or even office work. For durability, these boots are well constructed. The durable leather together with mock toe gives you a boot that is guaranteed to serve you for a long time. If you are looking for a comfortable boot that will still give you adequate toe protection, then the Keen Utility Milwaukee should definitely be on your radar. It comes with a toe protection, that is designed for protecting the foot from compressions and impacts. What sets it apart from other work boots, is the fact that it comes with an asymmetrical safety toe, which is anatomically correct. This implies that the toe box is pretty roomy. This additional space makes the boots more comfortable. Maximum protection and comfort are two major aspects, when it comes to work boots. The steel toe that was previously mentioned, provides vital protection. However, Keen pushes the bar higher with the Utility Milwaukee boot. They have been crafted with KEEN protect. This means that the outsoles of the boot, wrap up on top of the toe, to offer maximum protection. The outsoles are oil and slip resistant. This will protect you from fall and slip accidents. Additionally, the forefoot flex grooves allow natural movement of your feet, to ensure that your feet are not feeling stressed too much. Apart from protection, these boots are exceptionally comfortable. The main reason behind this, is the removable metatomical EVA footbed. A metatomical footbed is one that comes with support mechanisms for supporting the curves on your feet. Therefore, you get extra cushioning and fantastic support, every minute of every day. The interior of the boot comes with moisture wicking lining, which keeps moisture at bay. The nubuck leather upper is stain, abrasion and water-resistant. Comfort, durability and tough as nails attitude… that’s precisely what these boots radiate. These top-selling boots from the DuraShocks line are big favorites with many men, who want a versatile and durable work boot. There are numerous reasons why they are such admired and well respected fan favorites. Rugged durability, unmatched comfort, and good resistance to falls and slips, are some of those reasons. These boots provide stability, while absorbing external stresses and shocks. This prevents foot fatigue, allowing you to do your work comfortably, without having to fear injuries or accidents. They feature the typical Wolverine performance, full grain leather upper that allows vapor and perspiration to escape, as well as keeping water out. They are stain and scuff resistant, while the Direct-attach construction offers excellent durability. The outsole has been fitted with compression pads in the forefoot and heel areas. This rubber compresses when exposed to pressure, thus absorbing shocks, which are then unable to travel up your feet and legs. A dual-density, removable polymer footbed, also ensures shock absorption. The polyurethane midsole, fitted with fiberglass shank, provides adequate stability. The polyurethane outsole is water, slip and abrasion resistant. It has lugs for providing traction. The advanced tread design also ensures proper contact with the ground surface, for extra safety in wet environments. Whether you want original, field, road or outdoor boots, Chippewa has got you covered. Their boots are handcrafted in the US, with specifics that offer modern durability. These are some of the best and high quality logger boots that you can purchase today. They are crafted to provide the user with extreme ankle support and really great traction on different terrains. They are super durable and built to last. In terms of comfort, these work boots are filled to the brim with awesome features, which is exactly what you need from a work boot. In fact, the last thing you should worry about when you are sawing wood, is foot fatigue. The main feature of this work boot is its ability to maintain warmth and dryness in your feet. They are also waterproof, thanks to the chip-a-tex’ booties. On the other hand, the Rubi Dry-Lex 200 interior lining is constantly working to remove moisture buildup generated from sweat. Since these work boots will be exposed to different work conditions and environments, it is advisable to protect them with some water proofing cream for protection. The insole can be removed and replaced with your preferred orthotics, if need be. Safety is your main priority when it comes to work boots. And these loggers do not disappoint. They come with a toe protection as well as a vibram sole, that provides excellent traction. The Timberland PRO Boondock is a great work boot for different occupations. This waterproof boot offers that handsome and rugged appeal, together with additional comfort and protection, that you need for those long working hours. The boot is waterproof, featuring a full grain leather upper, together with a premium, waterproof membrane. This ensures that your feet remain dry all day long. Therefore, even if you are working at construction sites with pools of water, or other wet environments, rest assured that moisture will not be an issue. This boot includes dual density cushions, padded collar and anti-fatigue technology, together with two layer cushioning for shock absorption. Timberland takes your foot comfort very seriously, indeed. A contoured insole provides adequate support at any time of the day. Especially in the heel and ball area of your foot. These Timberland Boondock work boots give you great protection as well. The round composite toe protects the feet from any impact. On top of that, the boot is fitted with a rubber toe cap, which is abrasion resistant. They are electrical hazard certified, to protect your feet from electrical shocks. The non-metallic safety toe allows you to work in different areas, without being detected by metal detectors. The boots are waterproof as well. You can wear them in wet weather, without getting soaked. This is a highly durable boot with a Goodyear welt heel construction, fiber glass shank and Ever-Guard leather. With these Timberlands, you’ve got protection, support and durability all in one. Thorogood is a popular brand for customers looking for high quality work boots. The boot is US made, with several craftsmen involved along the production line. However, one feature that stands out is the man made sole that has been made to last for many years. They come with a shaft height of 6.25 inches, which is ideal for any work boot. Due to their height, they are able to protect your ankle sufficiently, while at the same time providing your lower leg with protection from various painful mishaps that may occur at your work site. On the other hand, the shaft is short enough to make sure they remain comfortable. Thorogood goes the extra mile when it comes to quality. Unlike other manufacturers that mix leather with other materials, these boots are full leather. As such, you can enjoy support and protection all day long. Comfort is not compromised in these super high quality Thorogood Heritages, despite their rugged nature. The moment you put them on, you will immediately appreciate the comfort they bring you. The removable dual density insoles and the vamp lining interior, together with the shock absorbing insole, have all been skillfully combined into one neat, little package. All this effort has been made to ensure that your feet remain happy throughout the day. They are super durable, safe, comfortable and will keep you well protected. Low-profile and lightweight, this work boot is easy to wear while still retaining its ruggedness. It is a hardworking boot, featuring a lace up shaft and a full grain leather upper. The insole has been attached using the Goodyear welt construction, for that extra bit of durability. Whether you are hiking in the woods, doing chores around the house, cutting trees or working at a construction site… you will certainly appreciate the toughness of this boot. This handsome work boot features a high performance lining, together with an oil resistant bumper guard to keep your feet adequately protected. The Goodyear welt construction holds the sole firmly to the rest of the boot. The sole is also repairable. A cushioned, mesh covered footbed, together with and EVA shock absorbing midsole that has been fitted with a steel shank, provide all-day support and comfort. On the other hand, a non-marking, oil resistant polyurethane outsole, provides you with all the traction your need, for your daily work routine. This is one of the best selling boots, in the long line of Justin Original work boots. It comes with a durable and rugged design, making it adequately prepared to handle challenges faced at the workplace. Weighing less than two pounds, it is one of the most lightweight work boots you can find. Due to its lightweight construction, the foot remains comfortable all day, even when putting in extra hours. It features premium oiled leather, which is both effective and classy in preventing water from entering the work boot. Each pair of Justin Original Work Double Comfort comes with an 8-inch shank, which reduces foot fatigue and provides the required daily support. The boot is also equipped with a seven-layer comfort system, which is designed to provide extra durability and comfort. The cambrelle-lined insole is removable. Therefore, you can replace it with insoles of your choosing, if this is what you prefer. The outsole is made of tough rubber, keeping the feet protected against any debris. With its superior construction, the feet are able to remain warm and dry, even in wet and cold conditions. The Magnum Response III is a handy work boot, especially for men working in law enforcement. The upper is composed of 900-denier nylon and action leather. The lacing system, which extends all the way up the shaft, secures your foot firmly. What you should be most excited about, are the high traction, the steel shank and the moisture wicking lining. Since you probably work for long hours, regardless of your feet type, or the socks you wear, your feet will most likely sweat. With the moisture wicking lining, the moisture in the interior of the foot is kept to a bare minimum. This is both more comfortable as well as healthier for you. Since you don’t know what you might encounter as you go about your busy work day, the steel shank has been added to protect your feet. It also provides additional traction. The boot is waterproof all the way to where the tongue reaches together with a robust construction. A composite safety toe has been added, as well as an anti-microbial treatment, to keep the inside of the boot clean and fresh. The outsole offers stable footing, as well as being slip resistant. All in all, these Magnums offer great performance and comfort. Working men deal with different weather conditions, ranging from wet grass, muddy fields, torrents, and concrete among others. If you want an all purpose work boot, then here is the Bogs Forge Tall ST. These work boots provide total waterproof protection. Since you can use them in sloppy conditions, these 100% waterproof boots come with non-slip outsoles that keep you standing tall and firm, just like the boots themselves. Additionally, these soles are non-marking. Together with the anti-microbial odor protection, the moisture that finds its way inside the boot does not produce bad odors. With these on your feet, you can trek through snow and experience the same temperature as if you are walking on dry land. Hand-lasted, natural rubber uppers, combined with a four-way stretch outer shell, offer a great fit straight out of the box. They reduce friction points, thereby providing you with breathability. The steel toes are industrial rated, to ensure thorough protection of your feet against impacts and toe stubs. The outsoles are slip and chemical resistant, to keep you safe from work hazards. Should a tractor tire accidentally land on your foot, you will appreciate the fact that the Bogs Forges have protected you from what could’ve been worse. They let you concentrate on your job, instead of on your feet. Carhartt has been producing quality wear since 1889. As for this boot, the performance is impressive. Talking about comfort, these boots don’t even have a break in period. They are comfortable right out of the box and only keep getting better with prolonged wear. The removable insole is thicker than those present in most other footwear, made from a combination of polyurethane and ortholite. Beneath that, there is an additional layer of polyurethane, as well as the EVA midsole. This results in a pretty cheap work boot, that provides high levels of shock absorption, mostly found in higher end boots. In simpler terms, it fits the bill perfectly for people tackling long shifts. It also features a steel shank for keeping your feet stable on uneven surfaces. All the standard safety features needed are present. A composite safety toe is available together with electrical hazard protection. The outer sole provides high levels of traction. The sole also has a ladder lock, for those of you who spend lots of time climbing ladders. If you are looking for a work boot that will keep you pain free, regardless of your working hours, this is a perfect choice. The Danner Quarry is a versatile pair of work boots, that you can wear in different work conditions. It features a full-grain leather upper, which offers protection to your feet. On top of that, the leather is durable and smooth. But it still maintains a rugged appeal. They have been crafted using a stitch-down construction, which provides increased stability. They also come with a vibram quarry outsole, meaning that the heel is 90 degrees, made of non-slip rubber compound. The tread pattern offers traction, while being able to release debris at the same time. If you just so happen to be an equestrian (= expensive word for somebody who rides a horse), then you are definitely going to appreciate the GoreTex lining. It is 100% breathable and waterproof. This allows you to walk comfortably in all sorts of conditions, without having to worry about a thing. With the GoreTex lining, your feet will always remain warm and dry. These work boots keep your feet comfortable, dry and protected. They are triple stitched to make them as long lasting as possible. The Redback Bobcat is built to last. It is constructed with thick leather, which is 20% stronger than that of conventional work boots. It also meets international standards and requirements, when it comes to safety. The oiled, full chrome tannage, ensures your boots are resistant to cracking and hardening. They will hold onto their shape for longer. These boots are designed with the cement lasted method. This means that the leather for the uppers is wrapped beneath the insole, then fused under pressure and with heat, using a polamide and polyester molten sealant. The anatomic sole design reduces arch flexing or sagging, reduced back and leg ache and reduced foot fatigue. They are super comfortable and grip well on different surfaces. They are never too cold or too hot, they just maintain optimum temperatures inside your foot. If you are a mail courier, then you will appreciate these sturdy work boots for doing your rounds. In terms of sizing, it is advisable to order a slightly smaller size than your average boot. You definitely want to obtain a perfect fit. They are great work boots for men with wide feet. You can also replace the inserts, should the stock insoles wear out. The Stanley Dropper 2.0 is designed for everyone who appreciates instant comfort and great support. These lightweight plantar fasciitis work boots come with a shaft that rises 10.5 inches from the arch, thus providing enough protection. The upper is made of 100% leather, which means it can withstand various liquids and solids that you might encounter in the course of your work. What sets the Stanley Dropper 2.0 apart is that you can wear them straight out of the box, since they don’t require any break-in period. Their fit is great, and they come with a steel toe for protecting your toes against falling or rolling objects. Designed for industrial environments, these plantar fasciitis work boots are equipped with a flexible rubber outsole, which is oil, slip and acid resistant. The outsole is also non-marking. They are easy to clean and durable. Their interior features a mesh lining, which helps to prevent blisters and hotspots as well as keeping your feet comfortable. On the other hand, the EVA midsole and the polyurethane footbeds supply shock absorption and superior cushioning. The footbeds are removable, making it easier to clean them. You can also replace them if you need more arch support. The manufacturer has also added a thermoplastic polyurethane (TPU) heel counter, for protection and durability. When you combine the above features with a Goodyear welted outsole that comes with flex grooves, you end up with a pair of boots that can handle the most demanding conditions at the workplace, while keeping your feet safe and comfortable. Stanley is renowned for exceptional quality, craftsmanship and innovation, and these boots are guaranteed to offer you that and even more. If you are looking for a reliable pair of durable work boots, then the Stanley Dropper 2.0 is ideal for your needs. Fashion meets durability with the Golden Fox Steel Toe Lightweight Insulated Moccasin. Every hard working man wants a work boot that is durable and comfortable. the Golden Fox comes with a polyurethane outsole that offers comfort, shock absorption and dependable performance. This work boot features premium oil tanned leather, that makes them ideal for men looking for stylish work boots. It is constructed using the Goodyear welt technique, making this work boot resole-able and therefore more durable. Its fine quality and triple stitching, makes it among the most popular in the industry. Their bottom features a polyurethane, heavy-duty wedge sole. With this foamed structure, air bubbles have been trapped in such a way that it makes the material flexible, shock-absorbing, and lightweight. On top of providing lightweight flexibility and safety, this work boot is also slip and oil resistant, making it ideal for different work conditions such as construction workers, carpenters, and ironworkers. The Goodyear Welt construction has been applied during the assembly. This technique produces boots that are tough and highly durable. The Goodyear Welt also produces lateral stability, as well as excellent performance. The material used to make the upper is extremely durable. They have also been fitted with a steel shank for providing additional stability and support. A revolution in design and engineering, these boots feature innovative performance to deliver a product that can handle the demands of various work environments. Once you have broken them in, they remain comfortable and fitting. They come with a synthetic sole, as well as an 11-inch shank, which protects your feet and ankle adequately. The construction is waterproof, featuring a full grain leather foot. They have been designed with Cobalt VX technology, for advanced support and temperature management. The toe area is wide and roomy, to offer free movement and prevent rubbing and friction. The outsole is oil and slip resistant. It is heavy duty, providing durability and underfoot protection. To add life to the boots, it is advisable to purchase some mink oil for them and apply it regularly. They are awesome work boots and will last you a long time. Especially if you maintain them well. The Reebok Dauntless Ultra-Light is a security-friendly, seamless work boot, featuring a 100% non-metallic construction. On top of that, it also has electrical hazard protection. An EVA removable cushion insert, working together with the injected and lightweight EVA midsole, provides all day comfort. It also comes with a moisture wicking nylon lining, to prevent build up of sweat and perspiration. This is both comfortable and healthy for your feet. It is airport friendly, meaning you won’t set off any alarm bells with it, and it comes with an inside zipper for easy taking on and off. The upper is made of seamless micromesh, which is breathable, allowing your feet to remain comfortable and fresh throughout the day. Without a doubt, the Original MuckBoots Hi-Cut Boot are good quality shoes, which are 100% waterproof. With a triple reinforced toe and a quadruple reinforced heel, you get work boots that are ready to get down and dirty. They have been fitted with a stretch fit-top line to ensure that you get a snug fitting seal, which ensures that water does not reach your warm feet. Another key feature of these work boots is that they are super insulated. With that in mind, you can work even during sub-freezing conditions, and your feet will remain warm. In terms of comfort, the Muckboots Company has taken it to a whole new level. The internal moisture wick system has been enhanced. No water gets in, while the internal moisture building up is instantly wicked away. These are also super flexible and lightweight. These features, together with an internal flex-foam bootie and hide heel, provide extreme levels of comfort. Although they lack a steel toe, that should not be a deal breaker. The toe is triple reinforced which gives you the freedom of working in different environments. Their steel shanks make sure that your ankles are fully supported. These women’s insulated work boots were designed with durability in mind. They are reinforced while the outsole is made of high quality rubber, to give you service for many years to come. These Women’s work boots by Timberland come with all the standard safety features, needed for the hardworking woman. If you are one of the women who handle tough jobs like electrician, lineman or foreman, these are the right boots for you. Apart from the safety features that include electrical hazard rating, an alloy toy and safety toe cap protection, these boots are very comfortable. They have been crafted using premium full grain leather on the upper, to provide you with maximum comfort, wherever your day takes you. The polyurethane midsoles and the nylon diffusion shank offer shock-absorption. There is also a high-rebound heel insert, which has been specifically designed to cushion and durability, whenever you need them. The footbed features Outlast Adaptive Comfort for regulating foot temperature while keeping you cool. On the other hand, the open-cell polyurethane footbed, which is antimicrobial and contoured, offers more airflow, preventing accumulation of bacteria that cause bad odors. They also conform perfectly to the contours of your feet. Their rubber outsole is just what you need, when working on slippery floors and surfaces. They are slip and oil resistant. The mesh lining has also been treated with microbial coating to provide even more comfort and odor control. You don’t have to wear men’s work boots on the job site anymore, thanks to these women’s work boots by Dr. Martens. They provide the perfect combination of durability, protection and comfort. These attractive brown work boots bring together the comfort features that you love in a pair of work shoes, with safety and performance features, which are highly necessary at the job site. Their uppers have been made water-resistant, supple leather, for superior durability together with comfort. The lace up, mid cut design features collars and padded tongues for improved ankle support and comfort. For additional rugged strength, these women’s work boots have double stitched seams. Inside these boots, you will find moisture wicking lining, which wicks away wetness and perspiration, for a dry and cool feeling, all day. Premium cushioned support is provided by Smartmask insoles. The cushioning helps in softening the steps while reducing foot fatigue and pain after a long day at work. Additionally, the proprietary air cushion rubber outsole from Dr. Marten guarantees remarkable support and traction. Goodyear Welt construction has been applied on the outsoles making the boots stay longer. Moreover, the soles offer added traction and slip resistance, on different surfaces. These tactical work boots are heavyweight and sturdy, specifically designed for the woman working in law enforcement. They have all the features and specifications needed to work in a wide range of environments. Stand out features include water resistance, padded tongue and collar, breathable moisture wick and durable rubber outsole. The padded collar and tongue provides that superior level of protection while the breathable moisture wick prevents buildup of bacteria on your feet. You are therefore sure that you will not be embarrassed by bad foot odor. Additionally, the rubber outsole ensures that you are sufficiently protected even in slippery and smooth surfaces. Its flexibility and light construction allow for easy maneuverability and movement from one place to the other. These shoes are designed with a sturdy leather material, which is also easy to clean and maintain. A zipper has been included to provide an easy on and off, while ensuring comfort around your ankles. Therefore, regardless of how much work you do during the day, you will not end up with sore or tired feet. They have been specifically designed for women, taking into consideration the foot morphology. Therefore you get a work boot that offers optimal fit and comfort, thanks to these women’s work boots with zipper. KEEN is a trusted brand, when it comes to creating quality footwear, and they don’t disappoint on this occasion. These women’s work boots come with a steel toe for protection. They are hiker-inspired ultra-light boots that deliver excellent waterproof comfort. The breathable, waterproof membranes, together with waterproof nubuck uppers offer exceptional wet weather comfort. On the other hand, the Dri-Lex linings wick away moisture to keep the feet dry and warm. Additional comfort features include the removable dual density EVA footbeds as well as compression-molded EVA midsoles for providing shock-absorbing and cushioned support. The torsion stability ESS shanks have been designed to offer flexibility and support, wherever your work takes you. For feet cradling comfort and a snug fit, they have been fitted with a contoured heel. They also come with asymmetrical steel toes for a protective and roomy fit. The rubber outsoles are non-marking, oil and slip resistant. These shoes are women specific to provide better fit and comfort. They are safe, comfortable, and highly durable. These are versatile work boots that are designed to handle the tough demands at the job site. ATS technology offers comfort and stability. The resistant outsole with barnyard acid injections comes with an extended sidewall which provides extra coverage. They also come with heel and toe protective caps. They are perfect for doing daily work as well as running weekend errands. They are highly versatile, featuring mid-cut leather upper that has detailed stitching together with the stability offered by a sturdy shank. With a side zipper, you can easily put on and remove, within a single a minute. Although you will buy them for your daily work, you may end up walking around town with them, since they are highly stylish. The mid-foot support prevents or minimizes metatarsal stress. The ATS footbed has been designed with a low-friction surface which prevents the foot from heat buildup as well as blistering. Additionally, these shoes have shock-absorbing gel cushion on the underfoot, which reduces skeletal impact stress especially on the knees, hips and back. These vintage women’s work boots have waterproof leather construction, allowing you to work and walk in different conditions and surfaces. If you are looking for a shoe that means business, then this is the perfect work boot for you. It delivers exceptionally, where most other work boots have failed when it comes to big projects. They are comfortable and durable, just ideal for the working woman. With a shaft height of 5 inches as well as an adjustable top that is 3 inches wide, you get work boots that keep you comfortable and grounded, as you go about your work. They are also roomy, allowing your feet and toes sufficient movement, breathability and flexibility. The lug traction out sole is oil and slip resistant. Together with shock-absorbing midsole, you get a pair of work boots that extra grip at your workplace, regardless of the condition. The Workshire Peril has been designed with nubuck leather or smooth leather upper, internal steel safety toe, rounded plain toe front, as well as reinforced stitched seam detail to deliver an all-round performance, where it matters. The soft fabric inner lining together with gel infused memory foam removable insole are perfect for long hours. The upper layer of these work boots has been manufactured using leather stress sewing, which provides an added style to these boots. 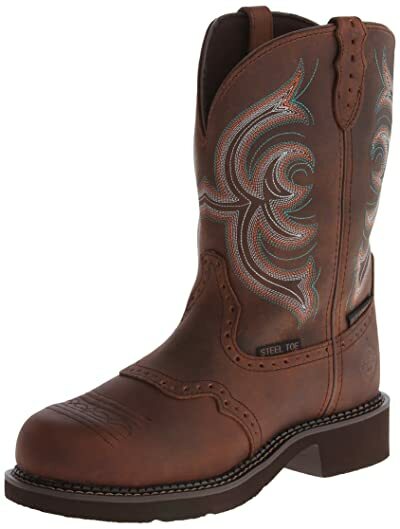 The Justin women’s Gypsy steel-toe work boots are completely waterproof. This means that you can rely on their comfort and quality, during your long working hours. They also feature creative decorations as well as good designs to suit the needs of the modern working woman. Another great feature of these amazing work boots is their cushioning and comfort system, which makes them supple and soft to wear and walk around. The orthotic insert is removable and replaceable. Therefore, if gets worn out or you need extra foot support, you can simply buy custom orthotics and replace the current ones. The round steel toes protect your feet against on site job hazards while the full waterproof booties ensure that your feet remain dry and warm. The uppers are made from full grain, premium and genuine leather. Therefore, you don’t have to worry about quality or durability, since that has already been taken care of. The patented comfort insoles together with the supportive steel shanks deliver fatigue-fighting cushioning as well as comfortable support during those busy and long working hours. The rugged rubber outsoles ensure sure traction when you are working on those slippery and slick surfaces. These women’s work boots by Wolverine are perfect for women who want to stay stable and steady when walking or working in slippery conditions. Moreover, they keep their toes and comfortable and safe, thanks to their composite toe. The aesthetics are appealing and they also provide the required safety and support. Although they don’t appear rugged and tough, they deliver exceptional performance. This means that women can enjoy the safety and comfort without feeling or appearing too masculine when wearing them. The work boots are entirely waterproof and have a breathable membrane for keeping the feet dry and perspiration free. The upper is made of premium, roughneck leather, while the outsoles are slip resistant. Overall, these boots are great for the working woman in need of safety work boots. They can also be used for hiking, among other outdoor activities that require toe protection. They have been from the highest quality material, which translates to durability. They are definitely worth purchasing. For additional comfort, consider orthotic inserts for added arch comfort and support. Just like their name suggests, these boots can be worn at the industrial and construction environments, as well as hiking. If you are tired of purchasing work shoes don’t fit you, or having to buy them at the men’s section, then you should be wearing these Avenger women’s work boots. They are specifically designed for the woman, in terms of sizing and foot morphology. This means that you will just choose your actual size, and work at ease. You can tell these shoes were made for the working woman. The brown leather on the upper is detailed with pink accents, to keep them feminine and sturdy at the same time. Other features include the front logo and the inner pink lining, which make you realize that they were definitely intended for the woman’s feet. Their leather is premium, full-grain material. It is a touch of luxury by itself. Since the leather is crafted from whole hide, you are guaranteed of the whole package. It is naturally flexible and resilient. The leather also feels soft around your feet while embracing them with every step. The dual density insoles provide dual soft support while the rugged outsoles keep your feet protected anytime. To ensure that you are work compliant, these boots have a safety toe cap, which has been made from tested steel, to meet all the demands and standards of the work place. Moreover, the soles are bonded to the uppers, to ensure that the shoes are water tight. The insoles are removable. Therefore, when the need arises, you can wash or even replace them. The slip resistant tread on the outsoles grips the surface, ensuring there is no slip or falls, regardless of the surface. When it comes to cowboy boots for girls, Twisted X always makes them right. These versatile work boots feature a protective saddle vamp and a smooth leather foot on a pull-on leather shaft. The collar has been designed using barbed wire embroidery accents, to give the entire shoe a touch of class and beauty. There is also a mesh fabric lining, which keeps your feet warm and dry. The mesh lining also ensures that perspiration does not accumulate inside the shoe, which might lead odors and other foot conditions. Don’t let the beauty of these boots deceive you. They are tough as nails, designed for the rugged outdoor environment. They can be also used for hiking, since they are light and flexible. They handle on-site job conditions perfectly, thanks to the rubber outsole, and the premium leather. The construction is solid, which ensures that you will get many years from these shoes, without the need for a replacement. 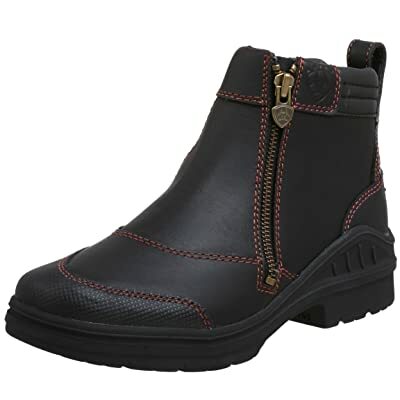 These women’s work boots with arch support can be used by ladies with high arches, without any issues. They are true to size and fit perfectly. They are fully waterproof. This means that you can cross streams and shallow creeks comfortably, without wetting your feet. They are lighter and fit better. Moreover, they provide plenty of internal space, for your toes to wiggle. The Safety Girl II are durable work boots designed for the working woman. They have been designed with a nubuck upper together with double color rubber outsole. The nubuck leather is full grain, which translates to longevity and durability. On the other hand, the rubber outsole ensures that the shoe does not disintegrate with ease. The sole is also slip resistant, giving you the freedom to work in different conditions and surfaces. Additionally, they feature a waterproof membrane which has been intentionally installed to ensure that the feet remain comfortable and dry, throughout the day. These steel toe womens work boots will keep your toes protected from rolling or falling equipment and objects. They are sold with two pair of laces. The standard black laces and an additional pair, in case the current ones become worn out. They are true to size and they are available in different sizes and designs. They might require one or two days to break in. however, once that is done, you will realize that they are one of the most comfortable boots that you have ever worn. Their construction is very solid, making them tough boots for outdoor work. Harley Davidson produces footwear with the unmistakable Harley Davidson performance and attitude, and that is what you get with these ones. These work boots for women feature a 14-inch leather shaft to keep your feet protected, whether you are cruising on the road, or just attending to construction duties. The shaft also contains thin buckled straps, to give it a sense of style, and enhance that feminine appeal. They are highly stylish, meaning that they can be combined with a flirty dress or black jeans. The choice is all yours. The shaft circumference is around 15 inches, together with a minor slit at the calf. This enables them to be flexible and move freely while letting your calf breathe sufficiently. The quality of the leather is just awesome. They will last you for more than seven years, with good maintenance. If you are looking for a good quality, nice looking and great boot for the outdoor environment, then this is the one to consider. Although they may feel tight initially, once you break in, they are very comfortable. These are work boots designed for the woman who works on tough job site conditions. The shaft is approximately 8 inches, made using full grain quality leather. Goodyear Welt construction has been used to hold the upper and the sole together. This gives them a very durable and sturdy construction. Additionally, the sole can be removed in case it gets worn out and replaced with another one easily. They also feature PU orthotic cushioned insole. The insole is also removable, which means that it can be replaced with custom orthotics. Although they don’t come with a steel toe, the leather is still solid enough to keep your toes and feet adequately protected from falling objects. These women’s work boots with arch support also prevent overpronation. They are highly comfortable, while the leather is soft enough, which means that no break in period is needed. They come with a tongue which is enhanced with memory foam. This ensures that the laces don’t extend and start digging into your ankles or foot. They are the perfect boots for heavy yard work as well as light activities such as gardening. They are hand oiled, making the leather appear absolutely beautiful. The oil also makes them waterproof and water resistant. If you work in an industrial environment, then you need the right type of shoes. That pair of shoes is none other than the Thorogood 14-inch insulated toe work boots. With these boots, you can go about your work confidently, knowing that your feet have the right levels of protection. The rubber used to make the upper part of these boots is flame and heat resistant. With such levels of protection, you can use them across various industrial settings and applications, without exposing your feet to hazards. These plantar fasciitis work boots for women come with a puncture-resistant bottom plate, which provides extra protection. Thorogood has also managed to strike a nice balance between protection and comfort. The manufacturer understands that most people who purchase these boots will be wearing them for long periods. Therefore, they are exceptionally comfortable. Also, slipping them on and off should not consume a lot of your time, thanks to the double pull-on tabs on the sides. Industrial work conditions can be quite demanding. But with this pair of boots, you can focus on your work knowing that your feet have adequate protection. These reliable Growler work boots will offer you the support and comfort that you need, to go through your work day. They are filled with comfort features such as moisture managing mesh lining, compression molded EVA midsoles and removable polyurethane footbeds. Talking about the lining, it enhances breathability keeping your feet drier and cooler. The midsoles and the footbeds combine together to cushion your feet, limit foot fatigue and absorb shock, throughout the day. Other tough features that you will encounter on them include composite toes, which meet the standards of working in a hazardous environment. The composite toes are much lighter than those found on steel toes while protecting you against compressions and impacts. The boots are grey and purple although you can also choose other color combinations that you prefer. Their uppers have been crafted using combined polyurethane and leather, for maximum protection and durability from jobsite scrapes and scuffs. You probably know that ill-fitting shoes are risky when working in hazardous environments. Due to that reason, these have been fitted with TPU stabilizing heel overlays to provide a stable and secure fit. Another great feature of these boots is the use of cement construction together with nylon shanks. These Georgia Women’s work boots are both tough and lightweight to push you through your workday. Skilled crafting and quality materials have been used to produce a stylish footwear for the working woman. They feature full grain leather uppers. The tanning process and the materials used in making this form of leather produce a rugged exterior, which is abrasion resistant. Around these Georgia boots, there is a rubber bumper which is designed to ensure oil resistance. This ensures that you have all the safety needed at the job site. They are partially water resistant and breathable, keeping your feet dry, warm and comfortable. Another benefit of using these shoes is their ease of maintenance. They are able to maintain the great look that you get when you first purchase them, throughout the year. If you look at them, you will realize that the soles have extended slightly past the upper. This is to make the sole long lasting, while still giving you some style. The sole is repairable and provides great lateral stability and excellent traction. Choosing footwear can be a very challenging situation. However, you can never go wrong with a reputable brand. Carhartt is popular for designing and creating high quality footwear, for both ladies and gents. Therefore, you can always trust them to deliver what you want. When looking for a work boot, you also need to consider the safety features that are available. The Carhartt Women’s Rugged work boot provides both comfort and safety, in these boots. They have been designed with composite toe protection that guards your toes against compression and impacts. The full grain leather uppers provide additional protection. The boots feature cement construction making them dependable and long-lasting. Their durable outsoles are heat, chemical, abrasion and oil resistant. A combination of abrasion-resistant rubber and gripping lugs make them ready for any job. They also have custom EVA inserts, together with ortholite cushioning. The Irish Setter combines function, flair and fashion to support both your sense of style and daily workload. The color accents and the silhouette give them an attractive design. They are durable and welt constructed featuring full-grain leather uppers for work boots that feels, performs and looks like no other. These are women-specific, in terms of design aspects, sizing and all nuances related to the female foot. Combined with a heel molded counter, Combat super knit lining as well as removable polyurethane membranes, they have been designed to last and withstand the test of time. Their superior performance and fit, makes them very popular among women working in demanding job environments. Underfoot, they have a Rubber-RPM Roper outsole, which has the features and technology to offer slip-resistant and versatile traction. The RPM technology comes with strong traditional materials without creating additional weight. You thus end up with a lightweight shoe but rugged enough to handle tough conditions. The Carhartt CWP 1150 is a durable and comfortable pair of plantar fasciitis women’s work boots, designed for those active and long days at work. They are tough, versatile and breathable. These boots are constructed using bison harness oil-tanned leather, combined with abrasion-resistant Cordura to enhance their durability. The materials used are sturdy and resistant to tearing. It’s also important to note that bison leather is significantly stronger compared to cowhide. Therefore, you are getting a durable pair of work boots, which can last for many decades with proper care. Apart from their durability, these boots are also water, dirt and dust resistant. As a result, an occasional wipe using soap and water should be enough to remove the dirt from the surface of these boots. A waterproof membrane will keep your feet dry from any water or moisture that you come across. Apart from that, this membrane is breathable, thus ensuring adequate air circulation to keep your feet cool. A PU Strobel pad, combined with a cushioned insole will deliver all-day comfort as well as shock absorption. These boots come with a rubber outsole, which is oil and chemical resistant. The outsole is also slip-resistant, thus making sure that you have enough grip and traction to handle whatever comes your way. Also, this rubber has great low-temperature properties, which helps it to maintain traction even when temperatures drop. Finally, Goodyear Welt construction enhances their strength and durability. The work boot reviews listed below have been replaced by the far better and more detailed reviews above. They are left here for my returning readers who want to view the old reviews again. The links to Amazon have been broken, because the reviews are a superior selection of boots. And I want nothing but the best for the visitors of my website! These old reviews will probably be taken offline in due time. 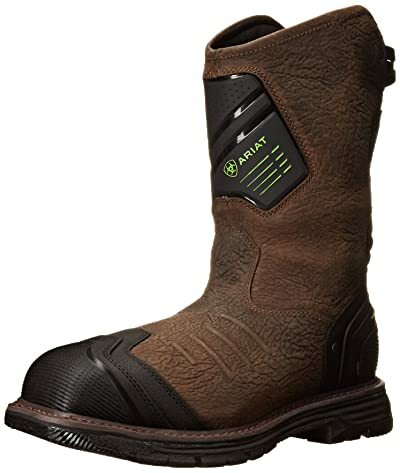 Ariat’s Catalyst VX boot is one of the best that money can buy. Not the cheapest. But still the most bang for your buck, because these last a long time. And I do mean a loooooooooong time. They are 100% pure leather and have rubber soles. The are high boots, providing even the largest of us with protection halfway up our calves. The XRD metatarsal guard (internal) allows you to drop a sack of bricks on these, and you won’t feel a thing. The composite toe is ASTM F2413-11 M I/75 C/75 EH rated. This is the absolute bee’s knees of work boots right here. Chippewa is a brand that has gained a lot of reputation in the past few years. These guys build super solid, super decent, high quality boots. Your colleagues will have no choice but to take you seriously when you are wearing these. They are made of high quality leather and come with a manmade sole. They are completely waterproof. As if that wasn’t obvious from the looks already. The metal parts hardware is completely non tarnishable. No stormy weather is ever going to rust these babies. The patriotic American working man can’t afford to miss out on these Chippewas. Thorogood knows what the working man wants. They highly value their loyal customer base and you can always count on them to come up with top quality footwear. If you are a fan of oil tanned leather, then these guys have a surprise for you! The Thorogood Heritage boot is one of the most distinguished ones I have ever had the good fortune of laying my eyes upon. Not only do they look good, they are also slip resistant and have dual density ultimate shock absorption. This is a really great boot for those of you suffering from painful feet. Danner is well known for creating great leather boots that will withstand mother nature’s elements for years on end. Made in the US, leather construction and vibram sole. Waterproof, naturally. What else did you expect? The name isn’t just a name. You can actually work in a quarry with these. The 8 inch alloy toes in these are going to protect your tootsies from a flurry of downhill boulder dashes. The rest of your body might take a few hits, should that ever happen to you. But rest assured that your tootsies are going to be perfectly fine! Timberland has released a work boot called the Pro Men’s Pitboss 6″ Steel Toe Boot, which has Anti Fatigue technology. Their boots have a very special industrial mat, which has inverted cones within a thick foam. This mat works by bouncing kinetic energy back into your foot for every time you lift your foot up and decompress the mat. Some people will still want to buy custom orthotics for these boots, though. Wolverine has a work boot called the Men’s Raider, which has an insole that is made of gel. These insoles will give you a very comfortable shoe straight out of the box. But you can still remove these insoles completely. Once again, a custom orthotic can give you even more comfort, since they are, by definition, customized for your personal foot. Caterpillar has a work boot called the Men’s Second Shift ST Work Boot. These are fitted with the so called Ergo System. This system means that the boot’s shape has been designed in such a way that it will give you the most anatomically correct fit for your foot. As far as this is possible for a one-size-fits-all boot, ofcourse. Once again, use custom orthotics if you are serious about having the best fit ever. A reader of the Boot Bomb was kind enough to email me about the fact that the insoles of these Caterpillars are non removable (thanks, Justin!). When you put insoles on top of the existing ones, it’s possible that your feet get pressed up to the top of the shoe. So either you have to be willing to go with the Second Shift’s insoles, or you have to make sure the boot is big enough to accomodate your feet, even after laying insoles on top of the stock ones (which is not recommended, by the way). Stock insoles usually wear away in due time, so you’ll be able to ‘replace’ them with custom ones, once they are almost completely gone. Plantar fasciitis is a very nasty foot condition that can cause you a lot of pain. The problem with this condition is that it is only going to get worse as time goes on. But that is only if you are not doing anything to cure it. The reason why you contracted it in the first place, is because you haven’t taken proper prevention measures to, you know, prevent it. You are most likely to get this very painful foot condition if you are placing too much strain on your feet, in one way or another. Placing too much strain on your feet can easily be accomplished by being overweight. I’m not here to judge you, ofcourse. I’m just saying that, if you have this foot affliction, then losing weight might be a good way of curing your inflamed plantar fascia, and making sure that it stays that way. Another way of putting lots of strain on your feet, is by standing up all day, such as for example when you are a store clerk. Hikers and workers of all sorts (store clerks, construction workers, barbers, etc.) alike can suffer from an inflamed foot tendon. And if you are to stand a chance of curing and preventing it, then you will have to make an investment in the best work boots for plantar fasciitis that you can get your hands on. The bottom of the foot is called the ‘plantar’. The actual tendon is called the ‘fascia’. It’s called plantar fascia, because it’s a tendon that runs all the way from the heel to the toes, all across the entire length of your foot. This tendon surrounds not only muscles, but also nerves. And that is exactly the reason why this affliction is so incredibly painful. Once inflamed and thickened, it has a much higher susceptibility to tiny little tears, which do nothing but exacerbate the problem, thereby expediting your one way ticket to a life long of chronic foot pain. A problem that you will most often see along with plantar fasciitis, is heel spur. You know what they say, right? Misery loves company. And this adage could not have been more spot on. Heel spurs are not the same though… they are tiny little deposits of calcium in the underside of the heel. These calcium deposits are mosten often made after a long period of severe stress (on the feet, not on your mind) or injury (once again on the feet :P). Sometimes, heel spur and plantar fasciitis are captured under the single diagnosis of ‘Heel Spur Syndrome’. Most people are treated with only non invasive (non surgery) methods. Your doctor will recommend that you stretch before exercise. You can also put your foot on ice for a while, in order to bring down the level of inflammation. You will also have to give your foot plenty of rest in order to recover. But you are also going to have to start wearing the greatest work shoes for plantar fasciitis you can find for yourself. You will be diagnosed with this condition when you are feeling sharp pains at the bottom of your feet in the morning, right after getting up. Or after standing up once you have sat down for a long time. In by far the most cases, a non invasive treatment is totally possible and will lead to satisfactory results in the long run. But for a small percentage of sufferers, surgery is, unfortunately, a necessity. You do not have to let it come to this. You can prevent expensive and invasive surgery by simply wearing supportive work boots in order to prevent it. There are plenty of aftermarket orthotics available, which you can swap with the standard insoles that come with your shoes or boots. These insertable insoles can be made from either rubber, gel or foam. They will give your foot a lot of cushioning in the ball of the foot, otherwise known as the heel. You will also get a lot of arch support from your insoles. Nothing beats customized orthotics. But when you are going to go for standard insertable insoles, then you can still get really good support. Take Ortholite, for example. This company uses a technology called ‘Open Cell Slow Recovery Foam’. This is a type of foam that, over time, molds itself to your foot and then stays in that particular shape. Did you know that you are able to fit yourself custom insoles straight from the comfort of your own home? There are kits available that come with a moldable gel, which you can stand on. You can then send the molds to a lab, which will produce your personalized insertable orthotic insoles, completely customized to your own feet. Are There Also Non Work Shoes For Plantar Fasciitis? You will probably not be wearing your working boots all day long. I have a construction worker in my own family and I know from experience that, when he gets home, he kicks those things off and puts on something a bit more comfortable. If he doesn’t go shoe-less or with slippers, he’ll put on sports shoes. Yeah, he’s one of those people that likes to wear sports shoes as leisure footwear. Take for example Nike’s Free 5.0, which gives you a lot of shock absorption during your walk. And while you’re wearing your sports shoes, you might as well go for a run. Rest assured that these shoes will protect your every step. Another shoe to consider is the Asic’s Gel Kayano. Have you ever though about the true cost posed to your company if you do not supply your workers with a proper work boot designed for the work that they are doing? You might be surprised at the truth, but the cost of ensuring that your workers are donned in the proper footwear is far lower than the cost that your company could possibly be faced with as a result of not doing so. The fact of the matter is that normal footwear is often simply not enough to protect the feet of your workers, and a lot of workers who go a step above wearing normal footwear are still only wearing protective work boots that are insufficient to provide them with the protection that their feet truly need to prevent injury. Incidents where this is the case can result in pay outs of between $38,300 and £56,700. The cost of that is certainly a lot more than what it costs to provide your workers with the protective work boots that they truly need in order to minimise the chance of them sustaining any costly injuries. New dimensions have been added to the footwear range during recent years as the media’s attention has become focused on metatarsal injuries. This newfound interest in such foot injuries started with Wayne Rooney and David Beckham sustaining such injuries just before major competitions. With the explosion of attention focused on metatarsal injuries that followed, insurance companies began seeking out new methods of not paying out. As a result, companies began searching for new work boots that provided increased safety and protection for their workers. Believe it or not, investing in the necessary cost that comes with getting the best that footwear has to offer in way of protective work boots will actually save you and your company money in the long run. Safety should always come first, particularly when the benefits far outweigh the risks. You will be saving more money, stress, and suffering on your workers’ behalf, by simply ensuring that each and every one of your workers is donned in the proper protective footgear for the job that they fulfill within your company. So what do the right boots for workers consist of? Well, the proper protection and safety measures for metatarsal injuries should be in place. The upper boot should be protected, either by a metal flap lying over the boot’s laces, or with a gel placed in the upper compartment used to absorb shock, or an internal slip made of a high grade composite or metal. Metatarsal work boots are made of the hardest wearing full grain leather with rubber and fibre glass used to make the soles. When deciding what work boots to provide your workers with, consider the true cost you will be paying at the end of the day. Is it really worth it to save some cash now only to be left severely regretting that decision later? Make sure you are providing your workers with the proper foot protection and putting the proper safety precautions in place. If you are going to work in a construction site or in any environment where there are a lot of hazards present. You want to make sure that you are able to wear the right protective gear all the time. This is necessary to not only meet the safety standards set in the field. It is essential towards ensuring that you will not always be worried about possibly stepping on something that might actually end up causing you to get injured or get wounded while working in the setting. The market is going to offer you a lot of choices to select from. It can be a little overwhelming to make a choice when you have so many of these choices to select from. It will help you make sound choices though when you have an idea of the many factors that should be taken into account when you have to make your choice. In this case, you can use these factors as your guide toward ensuring that at the end of the day, you get the most useful pair that you can find. Remember that curing your policeman’s heel (as it is also commonly called) starts with plenty of rest. If you are a hard working man or woman, then this will not always be possible. However, you can still get yourself a darn good pair of boots for your job. Because of today’s modern technology, you won’t have to choose between comfort and safety anymore. You can have both. Keep browsing until you find your own, personal dream boot. There is a good pair out there for everybody and you owe it to yourself to find them. You certainly do not want to lead a life of chronic foot pain. If you are developing a foot condition right now, then now would be an extraordinarily good time to take action. You will regret it for a lifetime if you don’t. Oh, and if you’re dead serious about curing your plantar fasciitis, then you might want to check out the Fast Plantar Fasciitis Cure. I’ve used it myself and have found it very helpful. Anything worth doing, is worth doing right. And you can’t play around with your foot health. So when I was suffering from it many years ago, not only did I start to take footwear really seriously, but I also followed this program, which I’m sure worked very well to help me get rid of it faster. 5 What Exactly Is Plantar Fasciitis? 6 How Do I Get Rid Of Plantar Fasciitis? 8 Are There Also Non Work Shoes For Plantar Fasciitis? Which boot are you referring to, James? I slid down a ladder 8 feet to hardwood floor. Smashing my heel bone. I have a plate and 9 screws. I’m a painting contractor. Could you recommend a boot for me. The Ariats listed above are the absolute best in my opinion. But that doesn’t necessarily mean they’ll be a good fit for you, personally. In your case I would go for a boot that gives maximum comfort at the heel. I haven’t seen what your heel looks like, but it sounds like good support is really important for you. I would go for a boot that, for starters, is wide enough at the heel so that you can fit in there comfortably. Click through to Amazon and have a look at the available widths and size charts. And in your case I would also get a solid pair of cushioning insoles for even greater support. I realize you’re in a difficult situation, so you might have to return your selection and try something else. Do you know where a woman could find simlar information? I loved this site! Thanks for your kind words. It warms my heart every time a reader takes the time to pay my site a compliment! This page contains only men’s, but you can click through to Amazon and search for the women’s editions of said boots. I had no idea that there was (much) demand for ladies’ work boots. I now see that there is. I will soon expand this page with reviews of women’s work boots! Thanks for the great article, Brian! We are a crew of two female interior house painters and are always looking for supportive work shoes suitable for ladder-climbing and being on concrete floors (all the houses are on slab foundations). I have plantar fasciitis in one foot. We prefer smooth soles that don’t catch on the rungs so will check out these smooth-soled suggestions of yours. For casual wear, I have just tried Kuru shoes for the first time about a week ago and I can tell you they are the best shoes I’ve ever worn for relief of my plantar fasciitis pain. I’m not sure if they are stiff enough for ladders but I may try them if I don’t find something better. I highly recommend them for anyone with PF who walks a lot or is on their feet all day. Seriously, I am indebted to those people for relief of my pain!! Thanks for a great comment, Pat! I really appreciate it that you took the time to share your experiences with me and my readers! Oh, and glad to hear your PF is doing better! My orthopedic doctor suggested Hoka One One shoes for daily use and I have to say they are the best in my opinion. They are a runners shoe and very light, and if you are shorter in stature it puts some height in it too. I have a fallen arch, plus the bone spurs, torn ligament on the bottom of my feet. I’m in need of a great composite toe shoe for work. I don’t like the steel toe for the heaviness, and I am not so much in need of a boot. I work in a warehouse and am on concrete all day. I am thankful for your site. I have a large foot for a female. I wear a size 11 in men, so a shoe in that area would be wonderful. Thanks for sharing your experiences with us. And about that composite toe women’s work shoe you’re looking for… I browsed around on Amazon and found this Skechers D’lite Toliand Composite Toe work shoe for you. You’re the second to ask about working footwear for women. I really need to update this page with more women’s reviews! Can’t thank you enough for putting this together. You are most welcome! Which boot did you like the most? Hi Brian! Great website thank you for putting it together… if you could expand it to include women that would be great… I know of 2 women that are experiencing PF issues and my boyfriend is having PF issues as well. it’s amazing how many people are affected by PF, before my boyfriend experienced it, I had no clue what it was. Thanks for your kind words! I’ve had multiple requests for female PF work boots already. I am a very busy guy, but rest assured that this is pretty high on my list of stuff to do. Make sure to check back later! My name is Viral.Me and my wife have same problem of heel pain particularly after walking and standing long time.I want to know what is beneficial either insole or custom orthotics ? I’d go for insoles before trying custom orthotics. My personal favorites are the Tread Labs Strides. They are really good and relieve me of a lot of knee pain! Hi Brian, I’m in construction, Plasterer and General building. I’ve recently suffered from a compound fracture to my ankle. The bone came out just above the top of my 6″ safety boot which also caused multiple fractures, meaning I’ve had to have plates and pins put in, and my Fibula bone is unrepairable, which means it’s going to be a weak point. Sorry to hear that you are having such problems with your foot health. I’m glad to see that you are taking it seriously, though. The Caterpillar Supremacy and the Magnum Stealth Force 8 are both damn fine boots. It’s hard to go wrong with them. However, my personal favorite are the Ariat Catalysts. Not only do I think they are by far the best looking work boots around, but at 11″ from the arch, they are also insanely high. They are pricey. But check the raving reviews. You will get what you pay for. You’ll be hard pressed to find better support than that for your fibula bone. You know your own support needs better than anyone else, so the decision is all yours. Best of luck with the recuperation and finding your dream boot. And please let me and my readers know how it worked out for you! I work in a warehouse and am on my feet all day on extra hard concrete. I am currently recovering from a partially torn plantar fascia. (Extremely painful) Can you recommend a steel toe shoe for me? I just so happen to have a page up on shoes for standing on concrete all day. The Rockport section has 3 boots, 2 of which are men’s. Both the RK6761 as well as the Sailing Club boat shoe have steel toes. The last one looks classy, too! I have plantar fascia and have been wearing Gravity Defy shoes for 2 years. Seems like they don’t last very long till I hear the heal clicking. I assume the spring in there has broken. They took away all pain till now. Also have a problem with pain on top of my right arch. Looking for a mid ankle boot with some traction. And can you recommend a good athletic/walking shoe. I’m on my feet walking all day. You want a mid ankle boot with traction that you also want to use as an athletic/walking shoe. Do these Skechers work shoes fit the bill? past an year before i had cancanus fractured in my left leg boot, so i am looking for best weight less shoes manufactured also its suitable as i am working with construction site..
You came to the right place. All boots on this page are excellent choices. In case of your fractured calcaneus, it would help to improve your boots’ support by wearing insoles with good heel cups! All the work boots on this page are excellent. I personally love the Ariats. They are both classy as well as super high quality. I have a plantar fasciitis info page up if you care to read up on it. It contains a section that explains how to treat PF at home. As for inserts… I wear nothing but Tread Labs myself! How about waterproof tall boots for WOMEN with plantar fasciitis! This article is useless to women. There is a women’s section in this article! I am a Bank Teller and am on my feet all day. I have purchased 3 sets of orthotics and many shoes. I have had this job for 4 years and my arches have fallen , I am experiencing overpronation . So I am looking for at least a ankle high boot that will help. Can you recommend something for me? This is a work boot page that features boots for harsh working conditions. Some of them even have steel toes. I’m not trying to be nosy or anything like that, but are these boots what you’re looking for for a bank teller job? I’ve got some ankle booties and fall booties up on here as well. Other than good boots, you’ll need good support. Does this help? If not, please get back to me so that I can advise you further. I am an old lady and had serious pain on my heel after hiking honey peaks around black hill with my sneakers last year. I think I had plantar fasciitis but it recovered for now. I wanted to buy a pair of good boots to prevent that happen again so I googled the best hiking boots. It came out some options that you did not mention. I wanted to know if they are good for plantar fasciitis. Could you please advice? Thanks! Off the top of my head… I wouldn’t know if all of those 20 are good for plantar fasciitis. If they cost more than $100, they usually are. It also helps to have good foot support to prevent PF. I put together my own top 20 ladies hiking boots this year. So if you want to know which 20 boots do I think are the best for 2016 and probably 2017 as well… they are a mere click of the mouse away! Thanks for the tips. I actually checked your “top 20 ladies hiking boots” before left this message. Guess I will buy one that was one your list soon. All the boots on that list are really good ones. I’m sure you’ll be happy with your choice! You are already wearing great boots and, judging by the price tag, really great insoles, too! 1. Address any remaining underlying cause of your PF. 2. Perform foot exercises to mitigate the pain. Please read my PF information article to see if you can learn something you didn’t already know. If you feel your boots aren’t giving you enough width, then select a wider boot. The ones on this page will take you to Amazon, where you can select width options. HI Brian, I have PF and heel spurs. I stand on concrete all day and I am required to wear steel toes. I have excruciating pain. Are there any shoes you could recommend? Sorry to hear you are in so much pain! It just so happens that I have an excellent pair of safety work boots up on my page about standing shoes for standing on concrete all day. I am referring, ofcourse, to the Rockport RK465 boots! You can also put your own insoles in there. Should you need a good pair, check out my Tread Labs review. I have a fractured right instep and my Dr. has recommended that I switch entirely to orthopedic shoes. Since I am not letting this condition hold back my dreams, could you recommend a suitable men’s work boots for farming in a tropical environment. If you’re going tropical, you’ll probably want boots that breathe really well. These KEEN Utility boots have mesh panels at the side. I’d try those if I were in your shoes! i am a cheesemaker and work in very wet conditions. I am starting to experience foot pain and shin splints with the long hours I work. I need a supportive boot that is waterproof and cleanable. i have worn Vikings for the last 12 years but need a change. Any suggestions? This page lists more than a few waterproof boots. Press CTRL-F in your browser and search for ‘waterproof’. Your browser will highlight some occurrences of ‘waterproof’ on my page! Also, for really great support, try Tread Labs insoles! Do you think this helps? I am looking for steel toe shoes that are for plantar fascitis. I have SEVERE PAIN IN MY FOOT. You came to the right place. Check out the Caterpillar, Keen and Golden Fox on this page! What safety work boots and safety work shoes are designed for orthotics to be inserted. usually the removable insoles are very thin, so orthotics don’t fit because the orthotics are usually thicker than the removable insole. There are numerous boots on this page that can take custom insole. The Chippewa and the Carhartt, for example. Press CTRL-F and search this page for “insole” and you’ll find more. Oh, and if you’re looking for good insoles… I highly recommend Tread Labs! All the work boots on this list are high quality stuff. But if you’re dead serious about having great support, then I recommend you purchase a pair with a removeable insole, and then put in Tread Labs insoles. I’ve never worn Kuru before, but from what I can gather they are pretty good shoes. I’d totally be willing to give them a shot if I were looking for work boots. I have a calcaneus spur / heel spur on my left feet. I am on my feet for 10 to 12 hours a day. can you advise me which steel cap safety shoes I will go. It would be a great help to me . I’d probably go with the Caterpillar Diagnostics up top, myself. Thanks for your great website. It is very helpful and informative. My husband has a very unique situation. He works outdoors, including logging the winter months, so he needs an insulated, waterproof work boot with a good tread. He also needs an all-around workbook for construction (not logging) in the spring and summer. He has a giant bunion on each foot and has a hammertoe on one, so he needs an extra-wide boot with a high toe box. We have not had much luck finding boots that work for him. Do you know of anyone who might make boots/shoes? Sorry to hear about your husband’s foot problem. I do not know of any manufacturer that is dedicated to making boots for bunions and hammer toes. However, if I were in his position, I’d go for composite and/or steel toe shoes and/or boots. Those were made with toe space in mind. Feel free to bounce some more thoughts off of me.